The extent of Hurricane Matthew’s devastation in Haiti is still coming to light after the storm hit as a Category 4 hurricane with winds up to 145 mph. At least 1.4 million people need humanitarian relief, with 750,000 in immediate need. International Children’s Fund is working with partners on the ground delivering relief supplies and assistance, reaching out to villages in the worst-affected areas. International Children’s Fund is sending thousands of meals to those affected by Hurricane Matthew. That’s where we need YOUR help. We need your immediate financial support to ship more urgently needed meals to our partners in the path of Hurricane Matthew. Thank you for being God’s hands and feet to those in desperate need. 100% of designated donations will go to this particular crisis or should we raise funds in excess of what's needed to respond to this particular crisis, then the funds will be redirected to where the need is greatest. Haiti’s losses and needs grow as our partners reach remote areas of Haiti that were cut off by downed trees, bridges, and mudslides. The death toll is expected to exceed 1,000. Thousands of people are known to be displaced and staying in temporary shelters. This has been a major stumbling block especially since there were many families still in temporary shelters after the 2010 earthquake. We are thankful to report that the houses we sponsored and built stayed strong through the storm and all of the villagers are safe. There are areas where people haven’t eaten much or had access to clean water in days. The hardest-hit area of Haiti’s southwest peninsula is seeing 80 to 90 percent of homes damaged or destroyed. A large portion of Haiti’s food is produced in the south where the damage is most severe. Hurricane Matthew destroyed many crops as they were coming close to harvest. For people who have lost all their crops “it’s not just about getting immediate relief supplies, it’s more like what happens next week, what happens next month? Food security and malnutrition, especially among children, were already a concern. In some of the storm-affected areas, about 30 percent of children show signs of stunting, which indicates long-term hunger. We’re working to address immediate needs, but we have to keep in mind that there will be food shortages for many families in the weeks and months to come as a result of this storm. How you can help? Pray for the people of Haiti. Ask God to bring comfort to the children and families who have lost so much. Please consider donating now to help provide relief and supplies to those affected by the hurricane in Haiti. Thank you for your prayers and support and for helping to provide hope to children and families in dire need. The people of Haiti are still struggling to find adequate housing and shelter after the 2010 earthquake. It is amazing to see the structures that have been built in place of all of the destruction just a handful of years ago. The 2010 Haiti earthquake was a catastrophic magnitude 7.0 earthquake, with an epicenter near the town of Léogâne, approximately 16 miles west of Port-au-Prince, Haiti's capital. The earthquake occurred on Tuesday, January 12th, 2010. By January 24th, at least 52 aftershocks measuring 4.5 or greater had been recorded. An estimated three million people were affected by the quake. 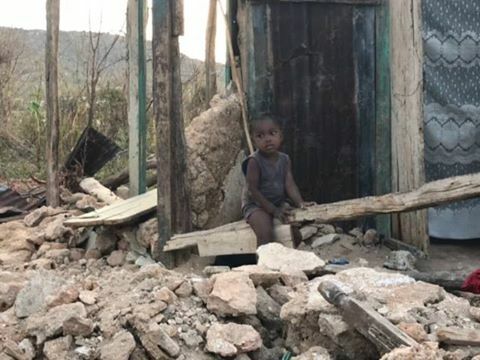 Death toll estimates range from 100,000 to 159,000 The government of Haiti estimated that 250,000 residences and 30,000 commercial buildings had collapsed or were severely damaged. Visiting the site where most of the destruction occurred left us heavy hearted. It is certain that the broken concrete and rubble is the final resting place of many. The lost are not strangers...they are family members. Fathers, Mothers, Aunts, Uncles, Brothers, Sisters, Cousins and the list goes on...The people of Haiti still mourn for the lost but are striving forward to rebuild not only their homes but their lives while all along, keeping alive the memory of their loved ones. The conditions of the tent city where they were living were deplorable. There is no running water or bathrooms. Garbage and debris has been spread everywhere. The area is ripe for cholera and other diseases including malaria. The economy has been left in ruins so unemployment is at its peak. As of January 2012, USAID reported that of the 1.5 million people that were displaced, 550,000 remain without permanent shelter. Friends, there is still so much to do. Please consider coming along side us and helping those in need throughout the world. © 2018 International Children's Fund.